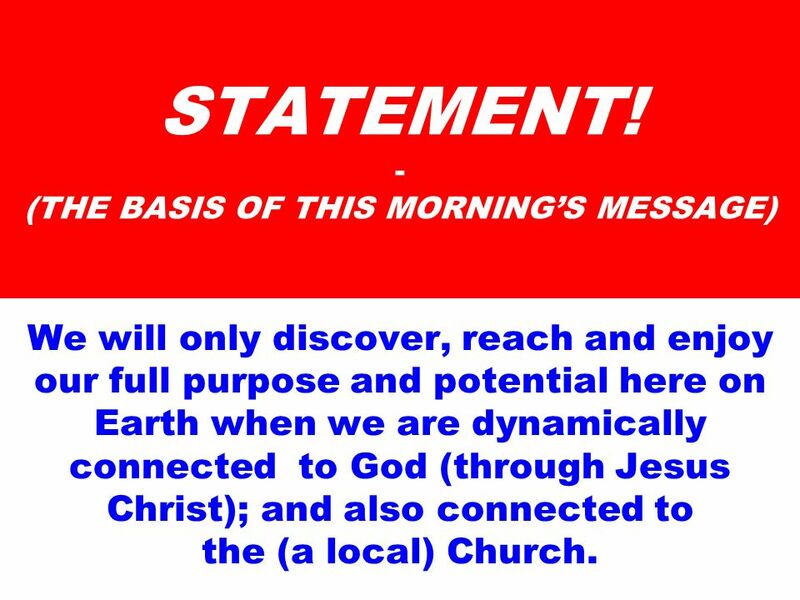 We will only discover, reach and enjoy our full purpose and potential here on Earth when we are dynamically connected to God (through Jesus Christ); and also connected to the (a local) Church. 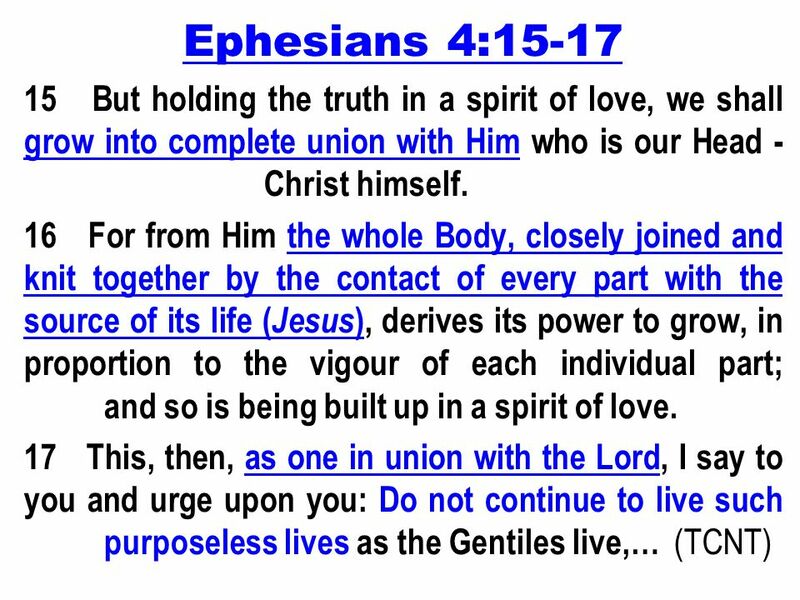 2 MY AIM To get you to see how very important it is to have a personal and active (healthy; whole) CONNECTION with God, and with His Church (through a local Church). 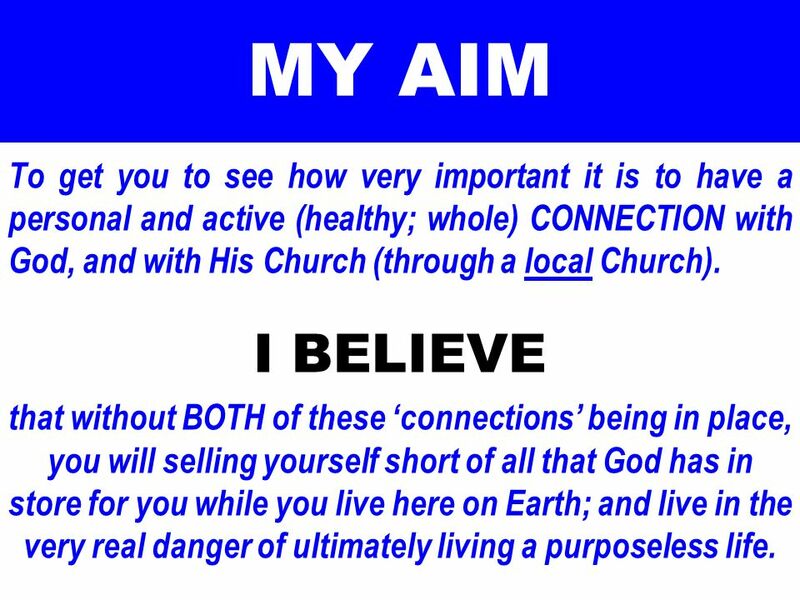 I BELIEVE that without BOTH of these ‘connections’ being in place, you will selling yourself short of all that God has in store for you while you live here on Earth; and live in the very real danger of ultimately living a purposeless life. 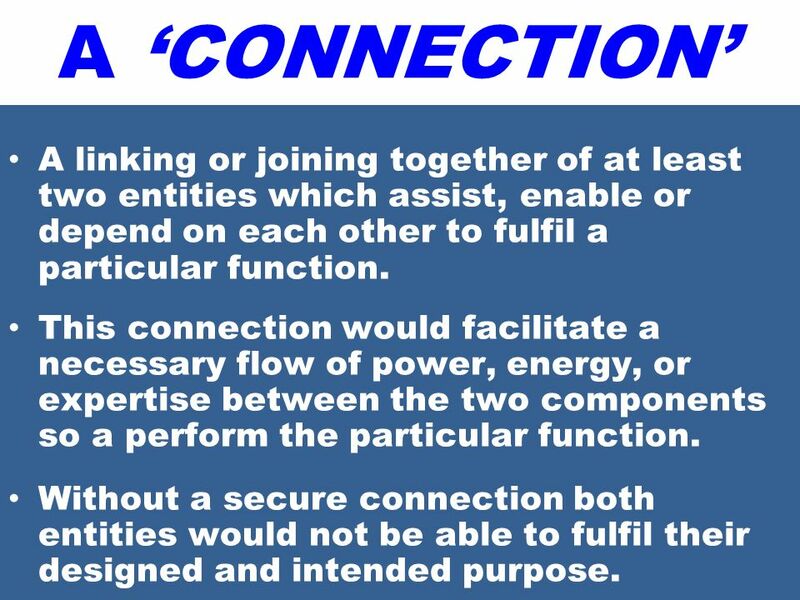 4 A ‘CONNECTION’ A linking or joining together of at least two entities which assist, enable or depend on each other to fulfil a particular function. This connection would facilitate a necessary flow of power, energy, or expertise between the two components so a perform the particular function. Without a secure connection both entities would not be able to fulfil their designed and intended purpose. 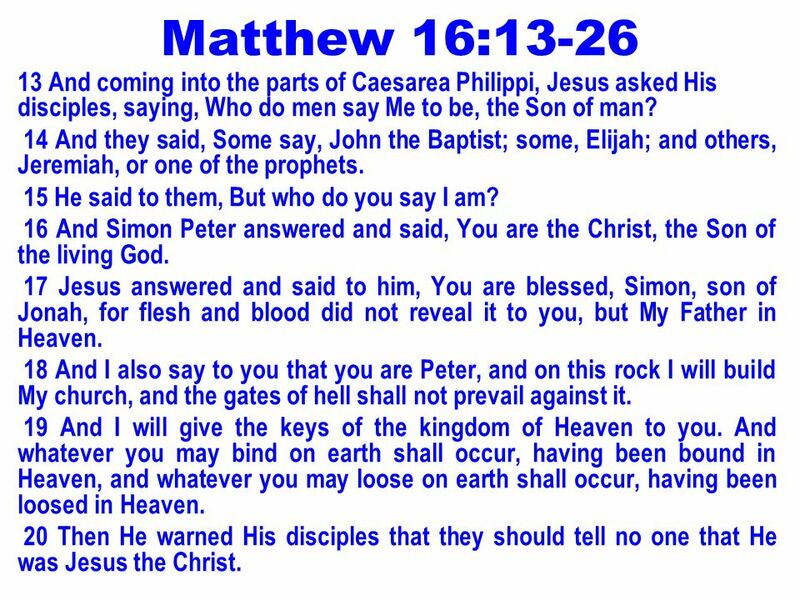 6 Matthew 16:13-26 13 And coming into the parts of Caesarea Philippi, Jesus asked His disciples, saying, Who do men say Me to be, the Son of man? 14 And they said, Some say, John the Baptist; some, Elijah; and others, Jeremiah, or one of the prophets. 15 He said to them, But who do you say I am? 16 And Simon Peter answered and said, You are the Christ, the Son of the living God. 17 Jesus answered and said to him, You are blessed, Simon, son of Jonah, for flesh and blood did not reveal it to you, but My Father in Heaven. 18 And I also say to you that you are Peter, and on this rock I will build My church, and the gates of hell shall not prevail against it. 19 And I will give the keys of the kingdom of Heaven to you. And whatever you may bind on earth shall occur, having been bound in Heaven, and whatever you may loose on earth shall occur, having been loosed in Heaven. 20 Then He warned His disciples that they should tell no one that He was Jesus the Christ. 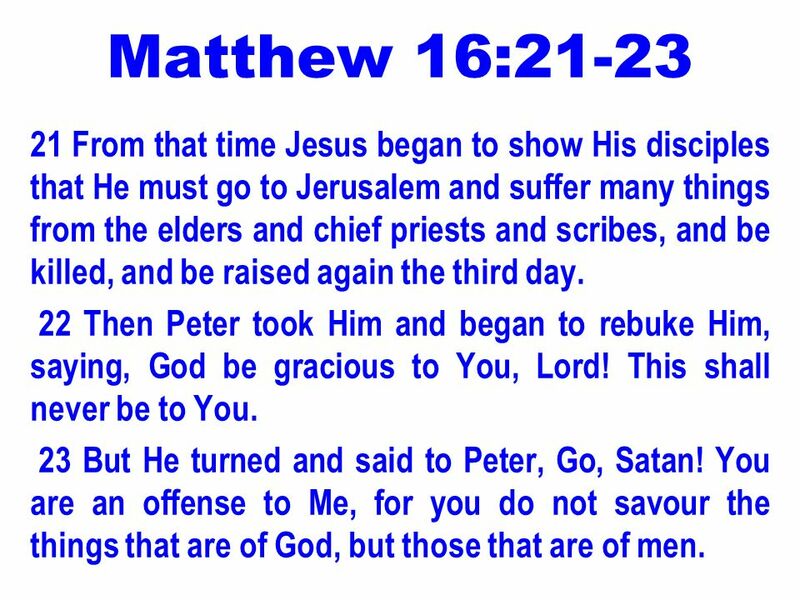 7 Matthew 16:21-23 21 From that time Jesus began to show His disciples that He must go to Jerusalem and suffer many things from the elders and chief priests and scribes, and be killed, and be raised again the third day. 22 Then Peter took Him and began to rebuke Him, saying, God be gracious to You, Lord! This shall never be to You. 23 But He turned and said to Peter, Go, Satan! You are an offense to Me, for you do not savour the things that are of God, but those that are of men. 8 Matthew 16:24-26 24 Then Jesus said to His disciples, If anyone desires to come after Me, let him deny himself and take up his cross and follow Me. 25 For whoever desires to save his life shall lose it, and whoever desires to lose his life for My sake shall find it. 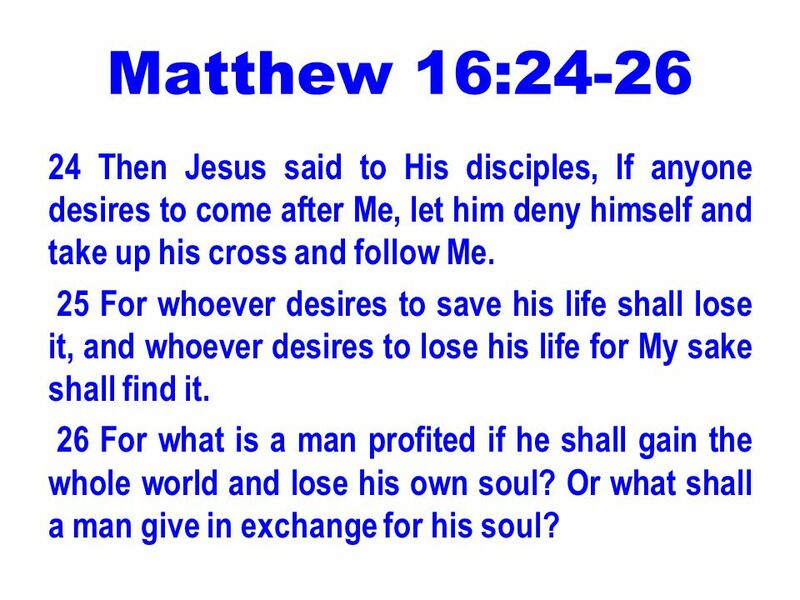 26 For what is a man profited if he shall gain the whole world and lose his own soul? Or what shall a man give in exchange for his soul? 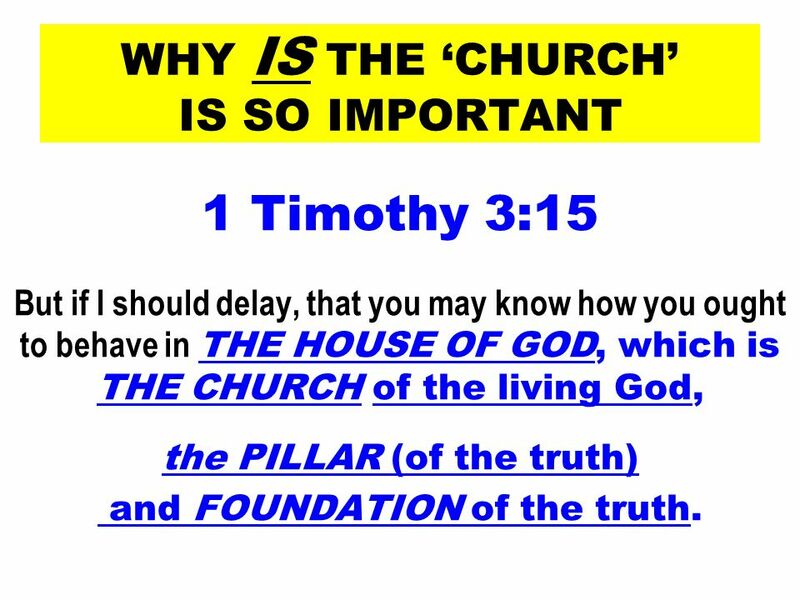 1 Timothy 3:15 But if I should delay, that you may know how you ought to behave in THE HOUSE OF GOD, which is THE CHURCH of the living God, the PILLAR (of the truth) and FOUNDATION of the truth. 16 HOW SHOULD ONE BE CONNECTED TO THE (LOCAL) CHURCH? 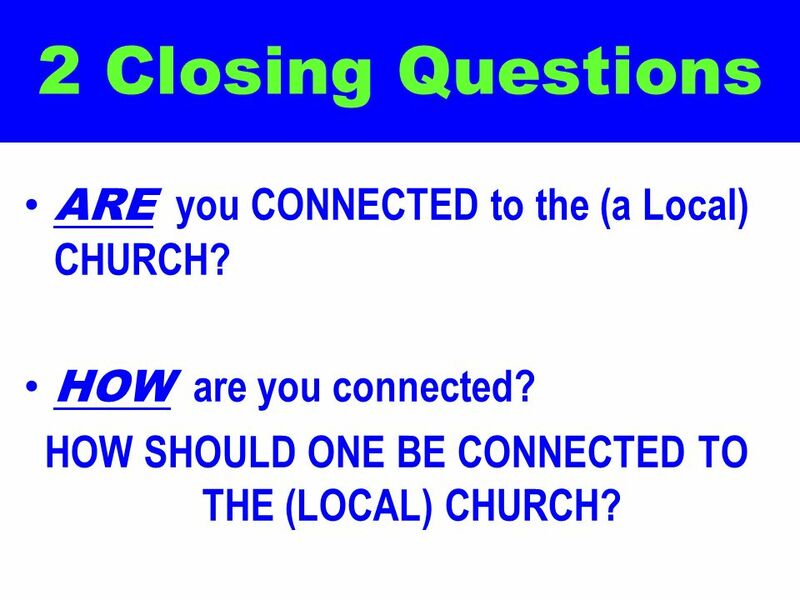 2 Closing Questions ARE you CONNECTED to the (a Local) CHURCH? 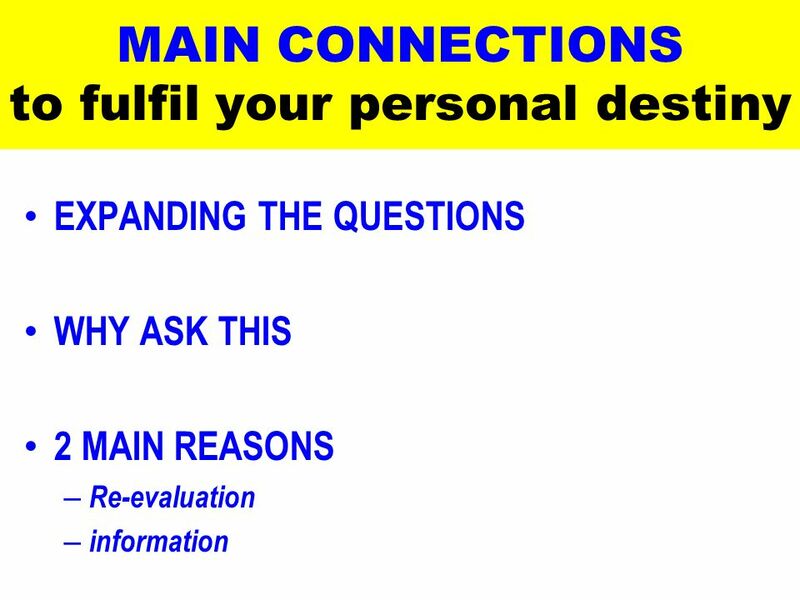 HOW are you connected? HOW SHOULD ONE BE CONNECTED TO THE (LOCAL) CHURCH? 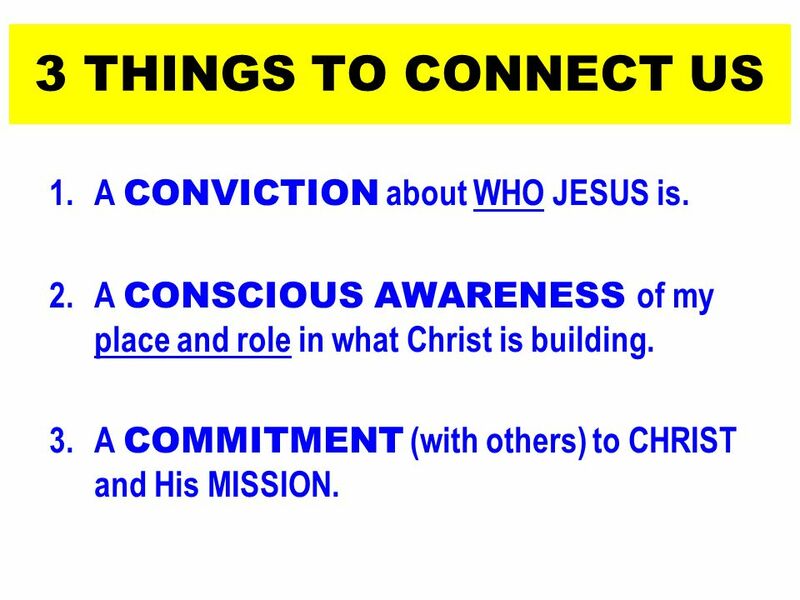 17 3 THINGS TO CONNECT US A CONVICTION about WHO JESUS is. A CONSCIOUS AWARENESS of my place and role in what Christ is building. A COMMITMENT (with others) to CHRIST and His MISSION. 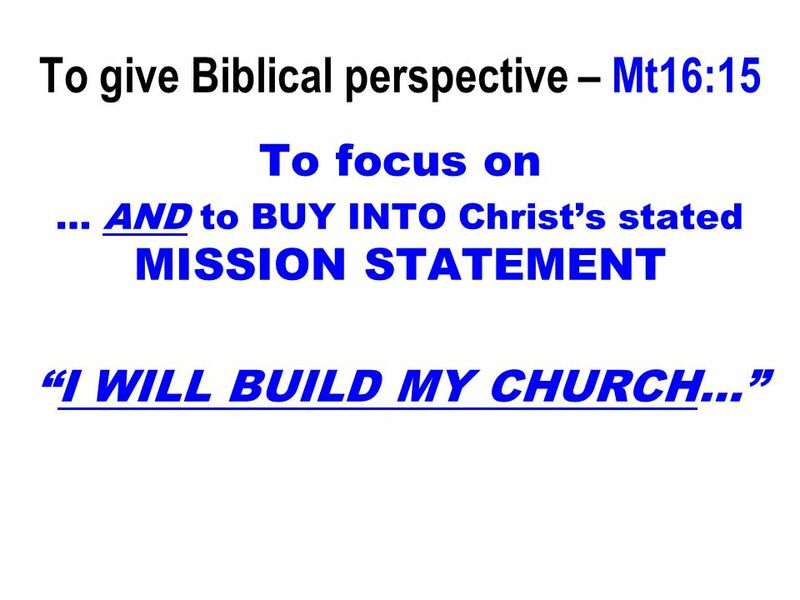 Download ppt "STATEMENT! 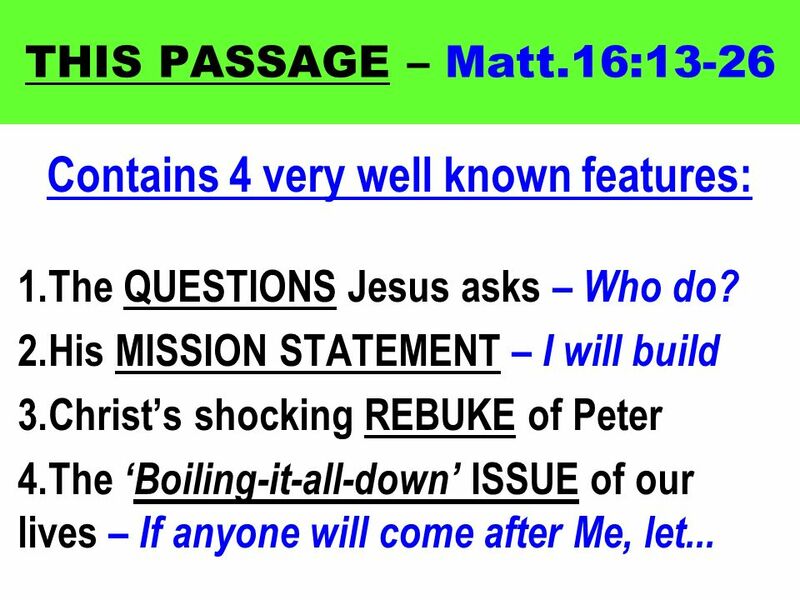 - (THE BASIS OF THIS MORNING’S MESSAGE)"
Peter's High Moment & Low Moment Mark 8:27-33 Jesus went on with his disciples to the villages of Caesarea Philippi; and on the way he asked his. I. Who Is Jesus? 1. A Real Person Richard A. Burridge states: "There are those who argue that Jesus is a figment of the Church’s imagination, that there. 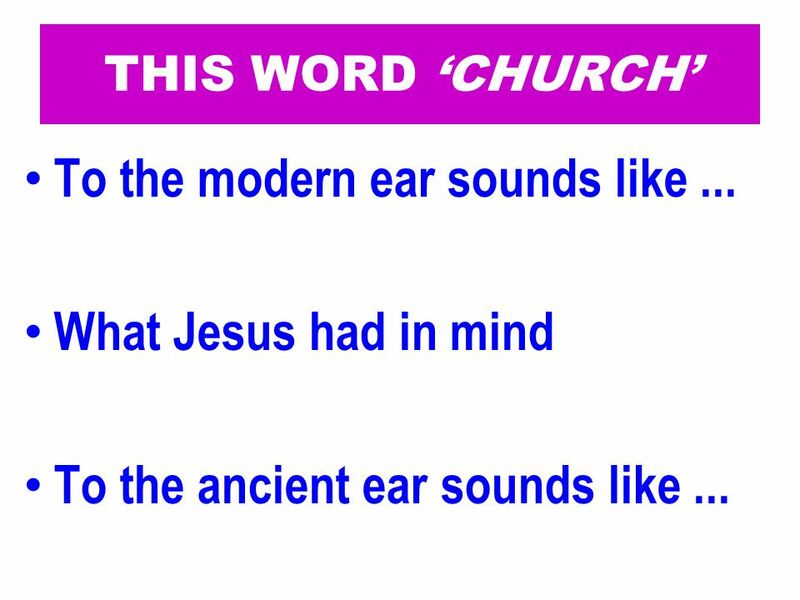 How does Jesus see church? 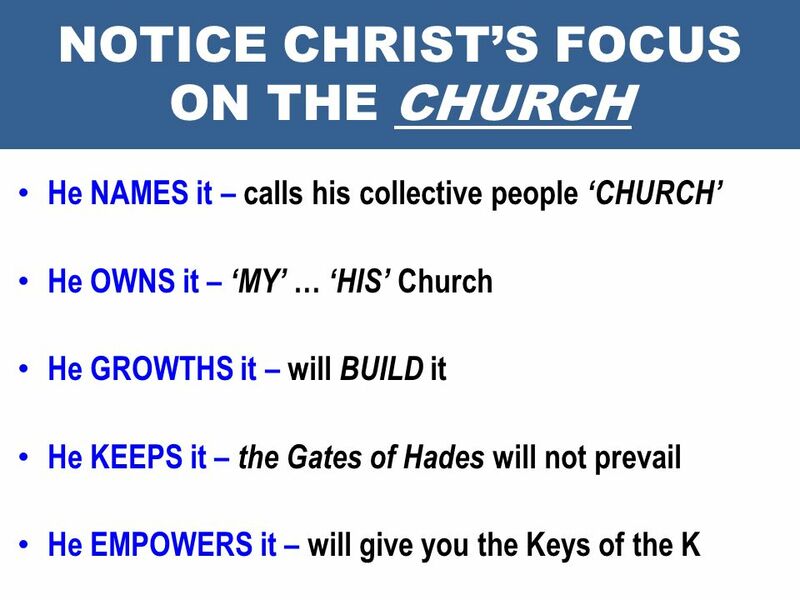 Matthew 16: Church is a holy people and not a holy place. Matthew Chapter 16. Matthew 16:1 The Pharisees also with the Sadducees came, and tempting desired him that he would show them a sign from heaven. FOUNDATION “The ROCK”. FOUNDATION  The act of founding, fixing, establishing, or beginning to erect.  That upon which anything is founded; that on which. Read the text. Reflect (prayerfully or otherwise) on what you’ve read for a while. Pay attention to whatever comes to mind from your reading and reflection. The Helper A Study of the Holy Spirit by Catherine Marshall Part 2.2 How do I receive the Helper? Accepting Jesus as the Christ Page 54. Elijah Judgement (drought) & challenge (Carmel) to worshiping Baal & theft/murder (Naboth) Life-giving provision from the LORD (oil, son) who is worshipped. “You Will Be Called”. 35 Again, the next day, John stood with two of his disciples. 36 And looking at Jesus as He walked, he said, “Behold the Lamb of. Mark 8:27-38 (page 769) 27 Jesus and his disciples left Galilee and went up to the villages near Caesarea Philippi. As they were walking along, he asked. (Mat. 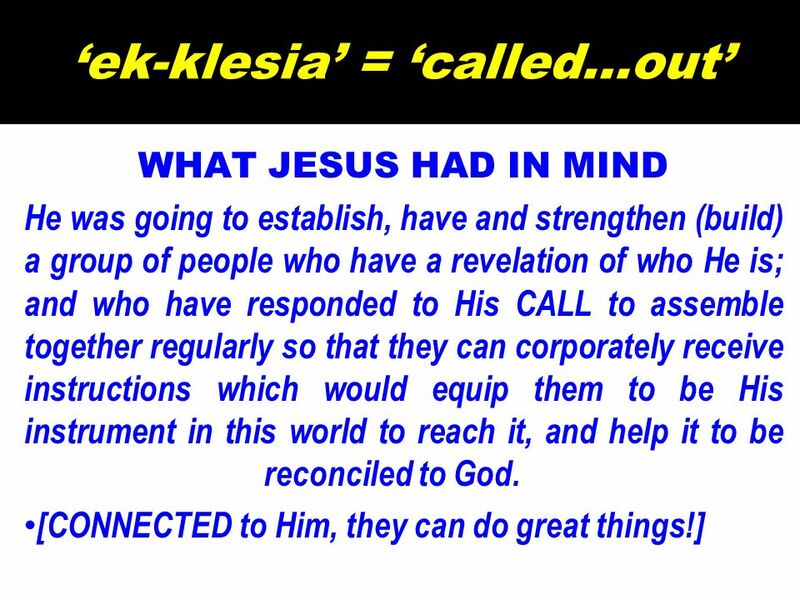 16:21-24) From that time Jesus began to show to His disciples that He must go to Jerusalem, and suffer many things from the elders and chief priests. Privilege of Being Commissioned Matt 16:13-19 When Jesus came to the region of Caesarea Philippi, he asked his disciples, “Who do people say the Son.